Six additional studies of our own that test 3 ‘search’ products (printer, camera, and kitchen mixer) and 3 ‘experience’ products (a hotel vacation package, one night in a hotel, and a massage). Evaluators of the variable (iPod, hotel with five-star pool, $750 fine, and $1,750 scholarship). 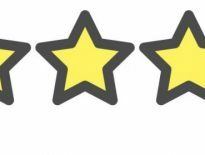 Evaluators of the variable plus the much less valuable add-on (song download, three-star restaurant, two hours of community service, and $15 towards textbooks). There were two versions of a persuasive list for each study: A version with 10 reasons including weak and strong reasons, and a version with two very strong reasons. Before jumping into our own tests, we first wanted to know for sure that these findings could be replicated, as the sample sizes were very low for most of the paper’s individual studies. So, we recreated a study from each research paper. In the 2012 study “Presenter’s Paradox”, participants who saw an iPod alone were willing to pay $65.48 more when presented with an iPod alone than participants who saw an ad for the same iPod plus one free song download. We re-tested this study, increasing the sample size to 596 (~300 participants per treatment), the original only had N = 41. 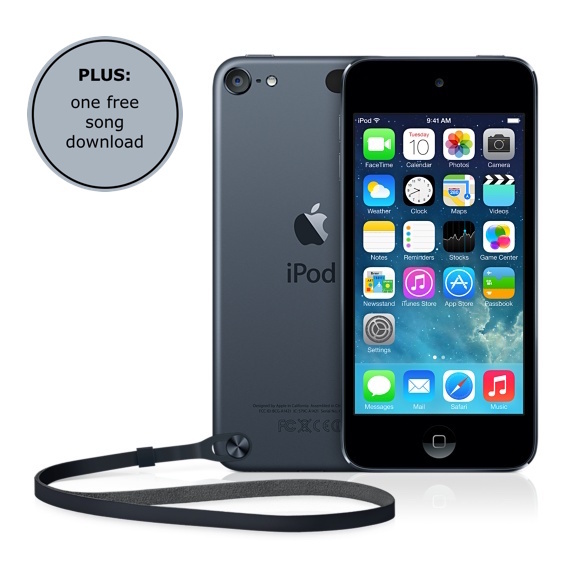 Participants viewed a photo of either the iPod alone (n=297) or the iPod with a graphic including one free song download (n=299). They were then asked, “Please estimate how much you’d be willing to pay for this iPod”. 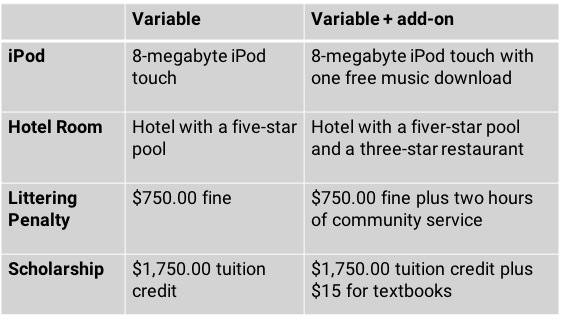 There was a $11.07 difference (though not significant) in survey participants’ valuation of the iPod Touch without the song download (M=$183.42, SD=$102.06) and the iPod with the song download (M=172.35, SD=$94.44) variations; p=0.17. There is a pattern of higher valuation for the iPod without the free song download, but it wasn’t significant at a high confidence level. In the 2014 “Top 10 Reasons” study, a sample size of just 34 participants revealed that two, strong reasons not to smoke are significantly more convincing than ten reasons varying in strength. We re-tested this study and increased the sample size to ensure the validity behind our findings. After reading this list, how serious are these consequences of smoking to you? In light of these consequences, how risky is it to smoke? Both questions were answered on a scale of 1-7 (1=not at all serious, 7=very serious). For question one, participants who read the three reason list rated the consequences of smoking at 6.59/7 (n=300, Mconsequences=6.59, SD=0.777). Participants who read the ten reason list rated the consequences of smoking at 6.4/7 (n=298, Mconsequences=6.37, SD=1.028). Those who read the three reason list against smoking perceived significantly more consequences than those who read the ten reason list (p=.004). For question two, participants who read the three reason list rated the risks of smoking at 6.06/7 (N=300, Mrisk=6.06, SD=0.749). Participants who read the ten reason list rated the consequences of smoking at 6.46/7 (N=287, Mrisk=6.46, SD=0.876). Those who read the ten reason list against smoking perceived significantly more consequences than those who read the three reason list (p=0.0298). IPOD DEAL – There was a weak pattern of difference in mean price valuations for the two iPod variations, indicating that the addition of the free song download slightly lowered price perceptions of the offer. SMOKING LIST – The short list of a few persuasive anti-smoking arguments implied more consequences, however a longer list of ten arguments of varying persuasion communicated more risks. Confidence intervals and estimated difference between value estimations of the mixer when it was offered by itself (top) and with a cheap ‘extra’ (bottom), in this case, a free cook book. Confidence intervals and estimated difference between value estimations of the printer when it was offered by itself (top) and with a cheap ‘extra’ (bottom), in this case a free gift card and redeemable harddrive. Confidence intervals and estimated difference between value estimations of the camera when it was offered by itself (top) and with a cheap ‘extra’ (bottom), in this case, a free additional battery. 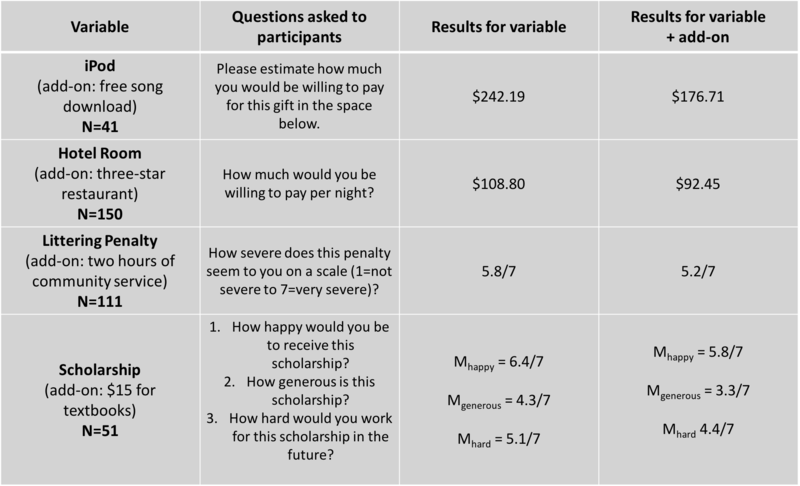 Confidence intervals and estimated difference between value estimations of the massage when it was offered by itself (top) and with a cheap ‘extra’ (bottom), in this case, a bottle of water. Confidence intervals and estimated difference between value estimations of the hotel night when it was offered by itself (top) and with a cheap ‘extra’ (bottom), in this case, free valet parking. Confidence intervals and estimated difference between value estimations of the Italy trip when it was offered by itself (top) and with a cheap ‘extra’ (bottom), in this case, boat cruises, cooking class, and concierge services. With the exception of the camera, these results generally, though weakly, support the idea of the presenter’s paradox. There were no patterns among experience goods (hotel stay, vacation package, massage) vs. the search goods (camera, printer, mixer). Note the camera bundle was perceived much more valuable (~$50) with the addition of a spare battery. This was the strongest pattern seen of any comparison. See our note below in ‘Limitations’ regarding a theory on this. In the “Reasons to quit smoking” replication portion of our study, we did not ask participants the third question which centered around likeliness to quit smoking after reading the persuasive list. We weren’t confident that the results of this question would stem from the list that participants read, but instead would stem from extraneous outside factors. Extraneous factors may have very well played a role in the results of this study anyway, considering that we do not know whether our participants were smokers, had lost a loved one to lung cancer, etc. Additionally, we replicated just one test for each study. While our results reflect those of the original studies, we cannot speak for the studies we didn’t replicate. We’re curious about the variable of product or package design, and if the aesthetics of the image affects perceptions in any way. Presenting the offer via a text description would have eliminated that variable and potentially provided a more valid test of the presenter’s paradox. Side note on the results of the inkjet printer test. There was a large difference in variation between the two surveys (with and without the freebie) that wasn’t seen in any other study (see the shape of the blue distributions within that study and among studies generally). We couldn’t explain this strange pattern after inspecting the study setup, but suspect something was screwed up in that test. With no real reason otherwise to suspect an error, we present it as is and added this note. For the DSLR camera study, participants estimated that the camera plus freebie would be worth more (contrary to the presenter’s paradox). There is a possibility that, because the camera had a picture of the freebie, participants felt like they were getting more and so estimated a higher cost. Notice that the other variations, which all follow the presenter’s paradox trend, do not include a picture of the freebie. This is an interesting nuance that may be worth further research in the future. This is a great post format. Do more. And of course, there is the fact that value is highly contextual and dependent to the individual. I can park my own car, but a cooking class in Rome is awesome. That’s me. It’s all about the perceived value and likelihood of that value being applicable to a customer. If I need a mixer, would some plastic attachment (I don’t know what it’s for) make it a higher value for me? No, as it’s not essential. If I need a camera, would an extra lens and battery make it a higher value? Absolutely, because I shall use both. The extras should be meaningful and valuable in order to increase the propensity to pay more. Agree with Peter re: “I think the notion of ‘utility’ of the extra item is important.” Best case here is the camera accessories, as he correctly pointed out. As interesting as this study is (and KUDOS to you for tackling the replication crisis!!) 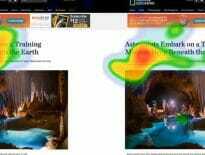 none of these findings directly address conversion. They *indicate* toward conversion, yes, certainly, we’d rationally expect holding price steady while lowering perceived value == lower conversions. Really really looking forward to a follow-up addressing transparent perceived values, assessment of add-on perceived value, and how all this affects conversion rates. Yo George, thanks for the comment and thoughts. Maybe some followup study ideas in there. On the ‘none of these findings directly address conversions’ I would ask you if you use data to form or support hypotheses in your testing? This is the key to what these studies are all about, providing extra data and study ideas for people to test more and more intelligently. Data is suggestive, not definitive. Even if we provided a testing case study it still wouldn’t translate well to all or even most other applications/verticals/traffic/etc. Which is in a way to your point as well.